The Jewish Labor Committee joins with all people of good will in our outrage at the events in Charlottesville, Virginia, surrounding the so-called “Unite the Right” rally on August 12, 2017. There is no place in our society for bigotry, prejudice, racism, and anti-Semitism. This language and those people who espouse it must be condemned at every turn. Our heart goes out to the victims of the neo-Nazis, the Ku Klux Klan and other white supremacists who marched shouting hateful slogans against African-Americans and Jews. They must be condemned, and defeated, in the press, on the streets, in the classrooms, in the workplaces, and in the halls of government, from the highest levels in the White House to every town hall and union hall across the United States. 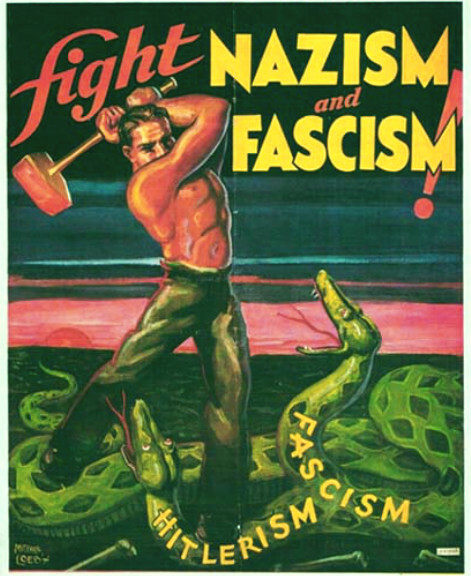 Poster by Mitchell Loeb, 1934. The Jewish Labor Committee, the International Ladies' Garment Workers' Union, the Labor Chest to Combat Nazism and Fascism, and others made use of it in outreach campaigns.